Fine American Paintings, Drawings, and Prints. Vienna's Golden Age. Born in 1941 in Tacoma, Washington, Dale Chihuly was introduced to glass while studying interior design at the University of Washington. 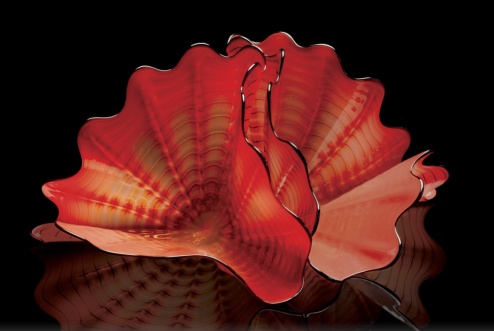 After graduating in 1965, Chihuly enrolled in the first glass program in the country, at the University of Wisconsin. He continued his studies at the Rhode Island School of Design (RISD), where he later established the glass program and taught for more than a decade. His work is included in more than 200 museum collections worldwide. He has been the recipient of many awards, including eleven honorary doctorates and two fellowships from the National Endowment for the Arts. Chihuly has created more than a dozen well-known series of works, among them, Cylinders and Baskets in the 1970s; Seaforms, Macchia, Venetians, and Persians in the 1980s; Niijima Floats and Chandeliers in the 1990s; and Fiori in the 2000s. He is also celebrated for large architectural installations. In 1986, he was honored with a solo exhibition, Dale Chihuly objets de verre, at the Musée des Arts Décoratifs, Palais du Louvre, in Paris. 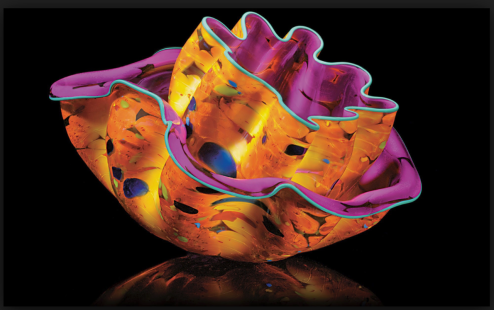 In 1995, he began Chihuly Over Venice, for which he created sculptures at glass factories in Finland, Ireland, and Mexico, then installed them over the canals and piazzas of Venice. In 1999, Chihuly started an ambitious exhibition, Chihuly in the Light of Jerusalem; more than 1 million visitors attended the Tower of David Museum to view his installations. In 2001, the Victoria and Albert Museum in London presented the exhibition Chihuly at the V&A. Chihuly’s lifelong fascination for glasshouses has grown into a series of exhibitions within botanical settings. His Garden Cycle began in 2001 at the Garfield Park Conservatory in Chicago. Chihuly exhibited at the Royal Botanic Gardens, Kew, near London, in 2005. Other major exhibition venues include the de Young Museum in San Francisco, in 2008, and the Museum of Fine Arts, Boston, in 2011. Current exhibitions include the long-term Chihuly Garden and Glass at Seattle Center and Chihuly at the Virginia Museum of Fine Arts which ran through February 10, 2013. For a comprehensive overview of Chihuly’s life and to see selections from his work, visit www.chihuly.com. Copyright © 2019 Nicki Solomon Fine Art. Powered by WordPress. Theme: Spacious by ThemeGrill.